Complete and structured content presentation: The key to success! Is the information about the diseases or the performed operations, based on your own, unique content? Did you copy your text from a competitor’s website because you did not have enough time to write your own? Do you enrich your texts with interesting audiovisual material (images, videos, presentations, articles) in order to motivate a visitor- who is not aware of you- to get to know you? The aforementioned questions are not random. 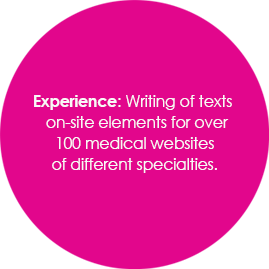 In the constantly evolving and competitive medical sector, a website must be distinguishable of its originality, uniqueness and content’s simplicity. How is this going to happen though, when we have to deal with medical diseases that are characterized by difficult terminology? This is exactly the time, we come into play! How? Moving long steps ahead the competition and enriching the qualitative characteristics of the content of your website. 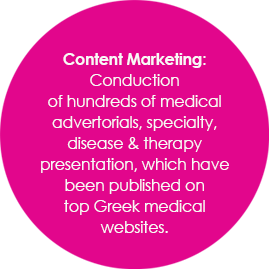 We create content that is search-engine-friendly, as well as, user-friendly and we present all medical issues by a holistic perspective. 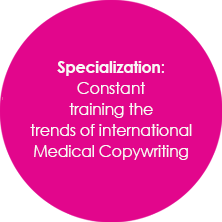 The full-developed model of Medical Copywriting forms an important innovation that we first inducted in the Greek market. For a medical website, the objective is to group the information, to classify the informative material and of course its quality/uniqueness. 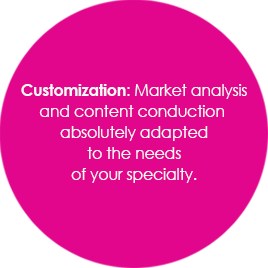 You will communicate your needs to us and we will implement the most suitable on-site strategy for your specialty and audience. 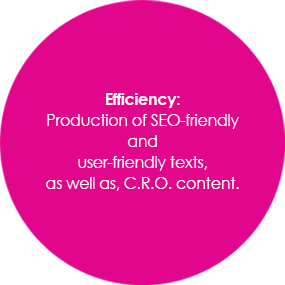 Our objective is not to “load” your website with monotonous and boring texts, but to convert visitors into clients.